There are a few new reports on the U.S. economy worth mentioning this morning. 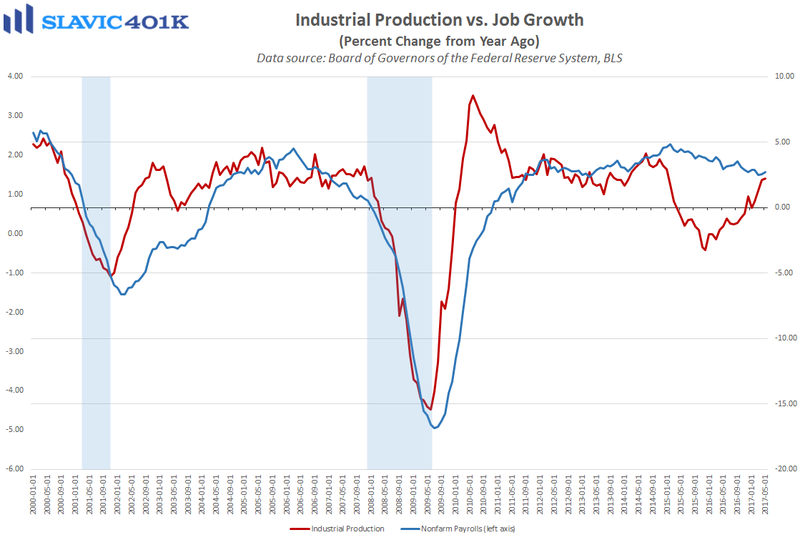 First, data from the Federal Reserve Board of Governors showed that industrial activity in America moderated last month, as total production was unchanged in May. That was worse than the 0.2 percent gain economists had expected and the weakest monthly reading since January. However, April’s figure was revised higher, which helped lift the annual pace of growth to 2.2 percent, the best year-over-year gain since 2015. 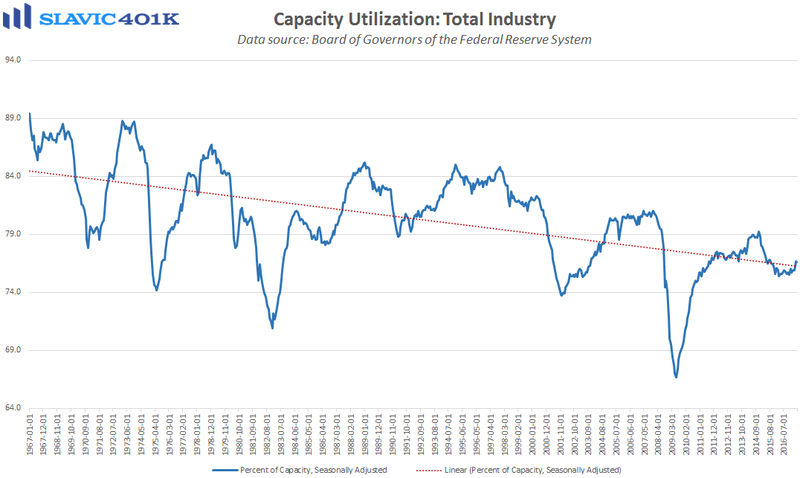 However, manufacturing, which makes up roughly 75 percent of all industrial production, fell by 0.4 percent in May, much worse than forecast, and capacity utilization, sometimes used as a leading indicator of inflation and potential output, slid to 76.6 percent. Overall, though, U.S. industrial production has improved in 2017, so subsequent reports will be more telling as to whether May’s slowdown was just a temporary setback or the start of a new trend. 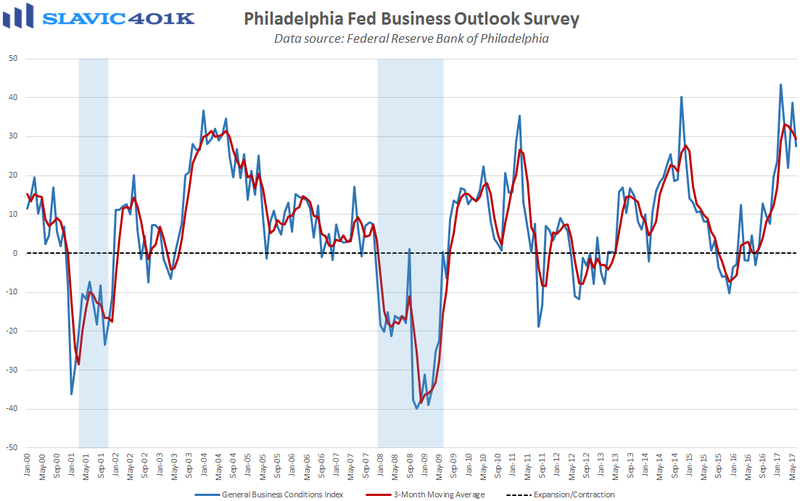 Next, a report from the Federal Reserve Bank of Philadelphia showed that manufacturing activity in the Mid-Atlantic region of the country cooled this month, as the general business conditions index fell from +38.8 to +27.6. That was a smaller decline than economists had anticipated and still one of the highest headline readings of the current business cycle. Under the hood, current measures of shipments, total employment, hours worked, and capital expenditure plans all deteriorated in June but only slightly as most of these gauges continued to signal a relatively elevated pace expansion. 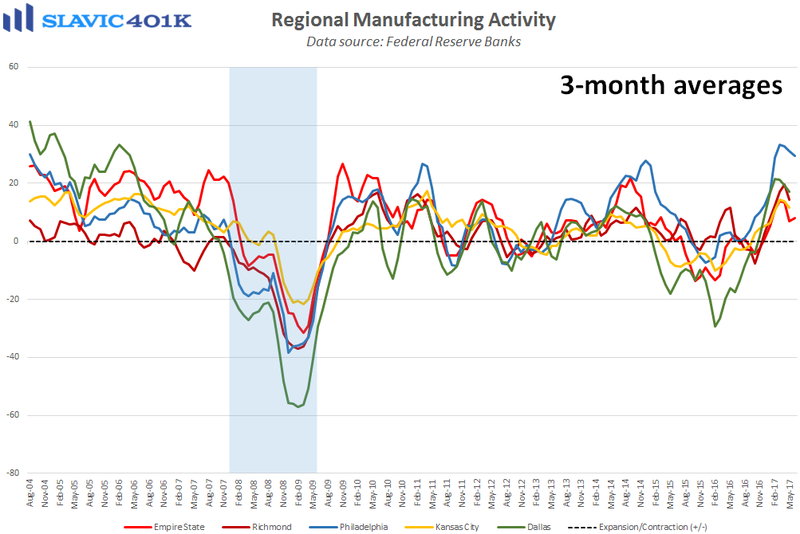 Even more encouraging was a report from the Federal Reserve Bank of New York, also released this morning, which showed that manufacturing activity in the Northeast region of the country rebounded significantly this month. 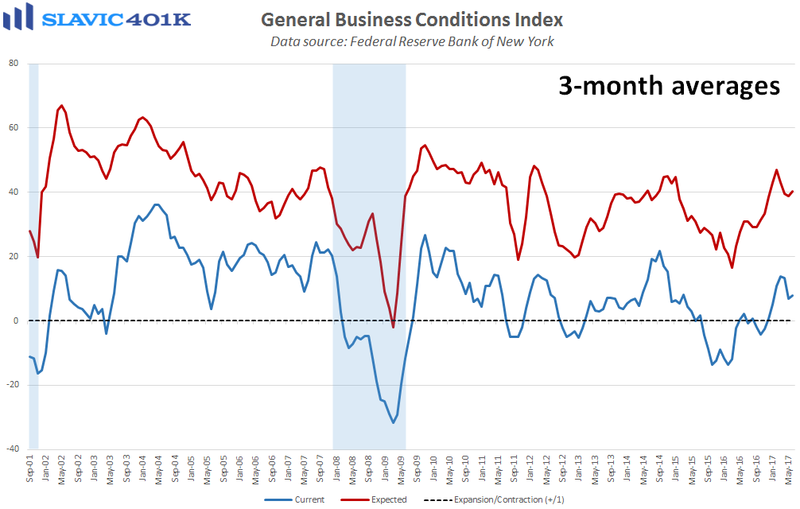 Specifically, the general business conditions index surged from -1.0 to +19.8 in June, the largest monthly gain since May 2003 and the highest headline reading in almost three years. Current measures of new orders, shipments, and hours worked firmed this month but total employment declined. Forward-looking activity gauges (six months ahead) were a bit more mixed in June but overall these indicators suggested that business managers remain quite optimistic about the future.